The national 4 days of AOTA — or stay longer! I’ve been living here for a number of years, and am happy to call it home base. If you’re staying in the downtown area, there are plenty of places to get to with a short walk, bike, run, or Uber if you’re tired after logging all the steps at AOTA. I’m going to share a few of my favorite “quick” things to do around the city, mostly which consist of food, if we’re being honest. So without further ado, here are a few of my favorites within walking distance of the convention center. Many of these places offer vegetarian options as well. Close to downtown: all walkable, all yummy! Another Utah classic: this one’s a local brewery. Stop in for some solid eats and local brew. Down the block. See description for Red Rock. Also, they do brunch. A chicken shop that will not disappoint. Hot chicken sandwich. Do it. A great Italian restaurant on Regent street. If you don’t mind spending a little more, this one’s a great option. All the bizarre pizza toppings you want, including the classics. Just be sure to be in a pizza mood when you go here. Offers great Italian thin crust pizza along with gelato. You’re walking all the steps at AOTA, so you earned it. A Utah classic, always busy, always a line, always yummy. Get the molé sampler, pick a molé, and get wowed. This one is close to the convention center and offers decent Mexican food. Not to be confused with the Red Iguana, which I find to have better molé. Amazing street style tacos — can’t miss on this one. Have yet to order something I didn’t like. Döner Kebab. Although I usually get the street cart fries when I go here. Hike the living room. Yes, it’s a hike, flagstones at the top arranged like couches. There used to be a remote up there. Great view of the city. Great spot for pictures, like this one I snapped last fall. Jog a lap or two at liberty park. Go skiing. We typically ski through May in this state. 14 resorts. Here’s one of me at Snowbird. Visit a national park if you’re around for an extra day or two. We have five. Take a tour of Temple Square. The Church of Jesus Christ of Latter-Day Saints is officially headquartered here. 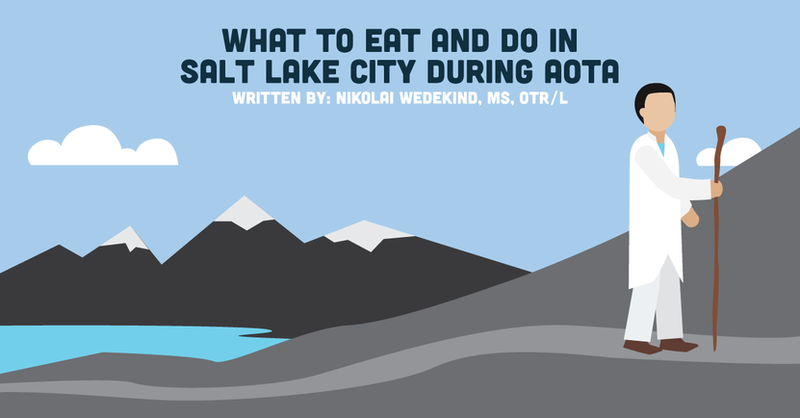 Eating, hiking, skiing, and learning — all great things to do while you're in town for AOTA!